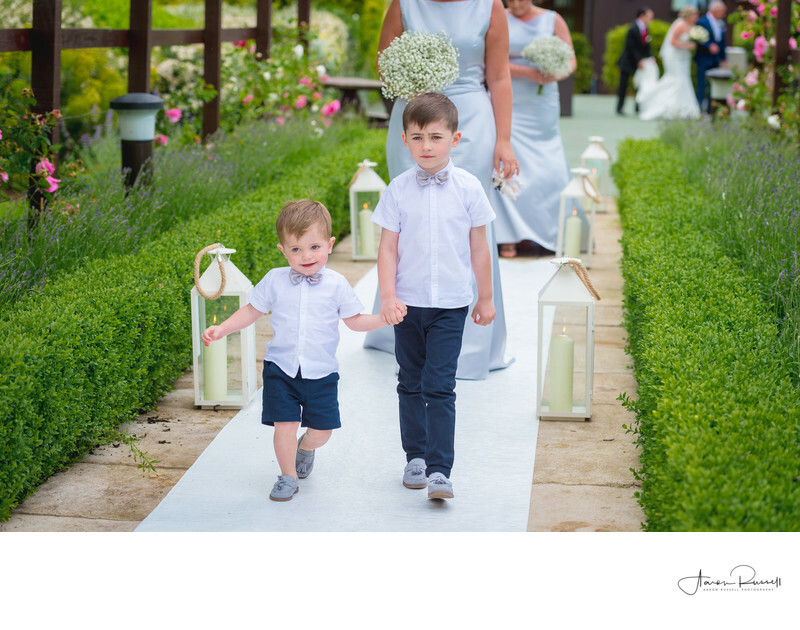 Lauren and Mitch had such a wonderful wedding ceremony, and I know that people aren't usually meant to upstage the bride on her wedding day but just look at these two adorable page boys, stealing the show! As any parent will tell you, the key to photographing kids and not getting a really cheesy smile is to do it in such a way that they don't realise they're being photographed. This is how I work where I can, so for this photo, I used the longest lens that I had, and knelt down so that I was on the same eye height as my subjects. I love the look on the faces of these two lads too, the boy on the right seems anxious as he escorts the younger page boy towards the wedding ceremony. The younger child, on the other hand, looks like he simply couldn't be happier. They say that ignorance is bliss, perhaps he's unaware of what's about to happen - or perhaps he just wasn't phased by the day at all! The most subtle thing about this photo is actually the one thing I like the most - how you can see the bride and her father getting ready to walk down the aisle at the very back of the image on the right-hand side.